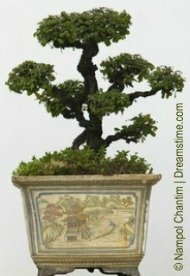 Accent Plant - a plant put on display with a bonsai when showcasing a bonsai. Adventitious bud - Bud that appears in a random or unexpected place on a bonsai tree, at a point other than the stem apex or a leaf axil. Air Layering - Air layering is the process of removing a large branch or section of the trunk of a tree or bonsai to create new tree. Akadama - A superior Japanese bonsai soil composed of red volcanic clay that is a perfect soil for most bonsai because it is a hard, coarse, clay-like soil that has a natural granular structure holdings water while offering excellent drainage; and contains ample air spaces even after several years. Apex - The highest point of your bonsai tree, whether that be a single branch or several. Apical - Most vigorous growth produced by a tree. In the majority of cases this occurs at points furthest from the root system such as the upper and outermost branches. Argillaceous Rock - Hardened clay that doesn't easily breakdown. Bonsai - A tree in a pot inhabiting as one to form a harmonious unit where the shape, texture, and color of one compliments and becomes intricately a part of the other. Every branch is either shaped, snipped, or eliminated until the perfect image is achieved and then maintained. It is not merely a tree in a pot. Cambium - Is responsible for producing the healing tissue that rolls over wounds between the bark and the wood. It is a single layer of cells that surround the trunk, branches, and shoots just below the surface. It is constantly redeveloping itself through the growth period. Phloem - Distributes the sugars made by the leaves to all parts of the plant, located on the outside of the Cambium and formed by the new cells. They are constantly replacing themselves with new ones annually. This gives each tree its own unique look and character. Xylem - The "rings" of age you see on trees is called the xylem and is formed inside the cambium's new cells. It's function is to move the water upward. The new xylem is what makes branches stay in place and grow when wired.